The boy's behaviour...: Where would we be without support? One of the very first things we undertook as part of our home study (that’s the bit where a social worker gets to know you in your own home and then writes a report about you to present to approval panel) was thinking about and putting together a mapped support network or eco-map as it was called. This was a kind of spider diagram with us in the middle, and bubbles all around us with names of people who we thought would be able to provide us with support, help, a shoulder to cry on, or parenting advice when we had a child placed. Our eco-map included my mum and her other half, the NC’s parents, our siblings, my step-sisters (one of whom is a neo-natal nurse), several sets of friends (2 of whom were nursery nurses), my grandmothers, and my uncle and aunt who are also adopters. I do recall also wanting to add the Adoption UK message board, which - in the days before being approved - was somewhere where I spent a lot of time researching, reading and chatting with others in a similar position. But our technophobe social worker didn’t consider this to be appropriate! Now, 4 years post-placement we find ourselves with a completely different support network to the one we envisaged. And it grows, recedes and changes as our needs and networks change, as well as when the situations of those involved change. Geographical distance makes a difference to practical support – those closer offer more, and those further offer less. But that distance also means that emotional support is sometimes easier as they are not involved with Mini and as influenced by their feelings, equally they haven’t seen so much of the harder times, the difficult Mini and it must be hard for them to imagine him having the struggles and anxieties that he has. Some of those on our support network offer no support at all, through no fault of their own, just circumstance, distance and their own lives moving forward – one of my step-sisters has never even met Dollop. But new and different supporters have come along - Mini has now been through nursery where the staff and director formed a part of our network, and helped and advised us through difficult times, health professionals – at times – have been involved. Mini’s foster family are still part of our lives – we’re friends with them, and they have filled gaps for us in terms of information. Now Mini is at school I have become friends with some of the other mums with children in the same class and of course his teacher has also become a part of our support network too. Back then, in 2007, I’m not sure I’d heard of blogs, and I’m fairly certain I hadn’t heard of Twitter. But now through ‘The Boy’s Behaviour’ and through Twitter, once again my support network has grown and changed for the better. Without all these different types of support - for us as a family and for each of us as individuals, we might not have even got here. In the early days - in fact within a day of Mini moving in, the NC was diagnosed with post adoption depression and his parents provided practical support for me - dealing with a 1yr old, and emotional support for him, and my mum too phoned regularly and kept me going and believing that it would be OK. Each and every one of those people who have appeared (and in some cases then disappeared) on our ever-changing eco-map have helped us and I can't express how grateful I am to them all for all they've done. Now - hopefully more changes - as along with preparing Mini for a return back to school and a return in routine, this week we’re preparing for appointments with a parent supporter, our first meeting with the post adoption support team, and another phonecall with Glenda (the mental health worker) too. Tonight, after I’ve been slapped round the face, pinched, kicked, pushed and screamed at, and the NC has been slapped, shoved, punched, growled at and shouted at, I hope these new additions to our support network really are supportive, and can offer us all some practical help. Hands and feet must be kept to yourself. I was advised to loose say 10 minutes of a favourite cartoon. Seemed a little consequence for my bruises but you know it began to work. Not 100% but rather then daily thrashing out maybe once every couple of months. Also if Mini is all for the big apology and remorse just say ok and walk away. Domestic Violence cycle hard to break. However, we don't make much fuss when we get apologies. We tend to just acknowledge it with a thank you. Your experiences ring very true for us. If we drew a map now it would look nothing like the one we drew eight years ago. Some on mine just did not 'get' trauma, but others have come forward, people I didn't even know back then and have provided such wonderful support. And you're absolutely right, the blog and twitter-spheres have opened up a whole new world. Thanks Sally. Looking back at that original eco-map, I'm really surprised at those who've given us most support, and so grateful for all those other people that are now on there. Rings true for me too. The fundamental network is still there, but now will additions. Thanks to Twitter et al, I can now connect with you guys and other adoptive parents. My network in the real world has little experience of adoption, so this new world is amazing, eye-opening, and heart-warming. With Pickle's more physical behaviours, we would remove ourselves. Have you tried that. It may not be that easy for you as I don't know what happens. For us, Pickle would jump on the settee next to one of us and start kicking, punching, spitting. Without saying a word, we would just move to another chair. It was like musical chairs at times, but finally he got frustrated at the fact we were moving around and then would promise to not hurt if we would sit next to him. Took a heck a long time to finally stop, but it pretty much has now. Just an idea? Thanks for your comment Claire...twitter and the bloggersphere are both great aren't they?! Glad Pickle's stopping with the agression...Mini tends to hit out when we remove him from a situation where we can see he's about to meltdown, so probably out of frustration at being moved. He's started hitting on time out/in too - so if he screams, we move him to the time out spot and try to help him calm down (cuddles, soothing words) - he returns the favour with slaps and punches. Other times it's seemingly more random - yesterday he was asked to come to the table for dinner, not only did he refuse, but he started hitting the NC and said it was because he didn't want dinner - we're not sure what the real reason was.... Result though - he went to his room, calmed down, came back and ate dinner - cue much praise for such a good choice! The support network we have built up (and that has changed for us too) since those early days is incredible! 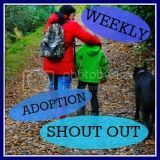 My best friends now are other adopters - most of who I met on adoption UK! Some friends just dropped out of the picture!